When HP unveiled Sprout, an all-in-one PC capable of scanning and projecting objects onto your desktop, it revolutionized how we interact with one piece of content across physical and digital realms. Today, HP has introduced software designed to turn these digital projections into three-dimensional images. 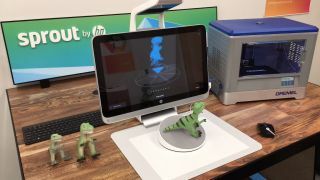 Sprout features a 23-inch (58 cm) touchscreen LCD monitor, a built-in projector that hangs over the monitor, and a 20-inch (50 cm) touchpad mat that can project inanimate objects onto the desktop. Essentially, Sprout enables you to take a snapshot of an object, which can then be projected onto your desktop and saved as a 2D image. Today's announcement, which includes new software and hardware, gives you the power to rotate the object any which way to create a comprehensive 360-degree scan. Theoretically ideal for design professionals, videographers, photographers and people who just love to use 3D printers, Sprout 3D Capture is an ambitious product that could further enhance the already-fantastic Sprout. There are two ways to use 3D Capture: you can manually rotate your object until the 3D image has been fully captured, or you can purchase HP's new Sprout Capture Stage ($299, about £192 or AU$385), which is essentially a turntable that does the rotating for you. One of the limitations of the Capture Stage is that you won't be able to access the bottom angle of the object. The Capture Stage tilts at a 15-degree angle as it rotates, so most but not all of your object's angles will be captured. However, HP's Eric Monsef, VP of Highly Immersive Systems, says you can simply create a second scan from another angle, which can then be combined with the original scan. Objects are held in place on the Capture Stage by four rubberized magnets. These magnets are capable of weighing down objects of up to 4.4 pounds (2kg). The Capture Stage itself weighs only 2.1 pounds (0.97 kg) and measures only 8-inches wide by 8-inches deep (205 mm). Basically, it's small enough to fit in the center of Sprout's 20-inch touchpad. Once scans are complete, either manually or via the turntable, you can edit or resize the image, either for realism or to enhance the design. You can send completed images to a 3D printer to create a replica object, or you can share your creation via email or social media without leaving the 3D Capture application. Unfortunately, the maximum 3D scan size is 8x8x8 inches (WxDxH). Capture Stage only connects to your Sprout via USB-3 cable (no wireless connections), which isn't that big of a limitation given that your object needs to be underneath the overhead projector to capture the image on your desktop anyway. Sprout was released in November for $1,899 (about £1,176 or AU$2,135). Our initial reaction to the PC was mixed: although we absolutely loved the ability to capture, digitize and manipulate objects on a digital screen, we felt certain apps treated the touch-operated mat as a second screen, rather than as a complement to the desktop monitor. Spout Capture Stage and Sprout 3D Capture will be available in July. HP did not provide a more specific date. 3D Capture will be available as a free upgrade to Sprout's current Snapshot software.